I just finished an OSC plugin for Quartz Composer that allows the user to change the IP, port number and address space dynamically through the input ports. The current version does not support sending QC Structures as multiple values, but I am looking into ways of implementing it. Please let me know, if you come up with a good solution. Download the plugin and the soure code. This plugin uses the VVOSC framework developed by mrRay. This entry was posted on Wednesday, July 15th, 2009 at 18:02	and is filed under Programming. You can follow any responses to this entry through the RSS 2.0 feed. You can leave a response, or trackback from your own site. Hmm, structures is interesting. I think OSC specification doesn’t allow structured data types. No it doesn’t, but you could do something like the Floats option in the QC default OSC sender. It takes a structure as an input and converts it into a message with multiple values. Yeah, I’m doing that with with the Animata OSC plugin. The problem is that I don’t know how to parse the structure and add it to the message so that it would support mixed data types. hmm, maybe set up an enumerator for the input NSDictionary or NSArray, and get the objects class, and set up a message node with this. I’m really just learning Objective-C, so half the time I have no idea what I’m doing. I just try out stuff and hope for the best. Does anyone know of a live link? So I can get this plugin also. Oh, sorry abut that. The latest version is 1.2. You’ll find all my plugins if you just scroll up and click the software link. 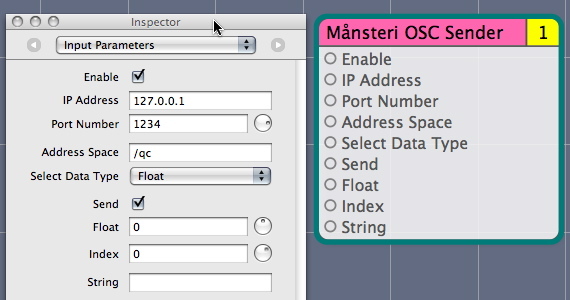 How should i format the Månsteri OSC Sender data if i want to send a message to a layer named putto. As i understand i send what i want to address for example /layeralpha in Address Space but where do i put the layer name? And i i want to send a /layerpos can i do that without two float? Sinc i cant sen a structure. Will there be an configurable (ipnumber) of the Animata quartz plugs? Fantastic by the way. It’s not possible to send compatible messages to Animata with the OSC sender since it can’t mix different data types. I’ll modify the Animata OSC plugins to have a configurable ip number. It’s really not a lot of work, but can’t make any promises when I have the time to do it since I’m buried in other stuff. If you can’t wait and aren’t afraid of getting into Xcode, you can modify the plugin yourself. You should be able to do it by following what I have done with the OSC sender. Thanks for your response, I am not a god x-coder, but will have a look at it tomorrow. Check out the new Animata OSC plugin. Just upated it. Should work for your purposes. i’m new in quartz composer, and I would like to use the osc sender to control another program, but I have troubles when the osc is inside on a iterator for example. It doesn’t send any data out (although it seems to do it), it is normal?, why?? thanks a lot for your effort. Hey. That’s not normal. It should work fine inside an iterator. What software are you trying to control? Could you send me your .qtz file? I’m trying to transform audio level input in Quartz composer into BPM to drive the speed of the clips in Resolume arena. May be it’s newbee understanding of your osc, but is it possible to export that from quartz?